Near universal participation anticipated in Passover holiday - even among secular Jews. The Passover Seder, the retelling of the story of the exodus from Egypt and accompanying festive holiday meal, remains enormously popular in Israel – even among irreligious Jews. 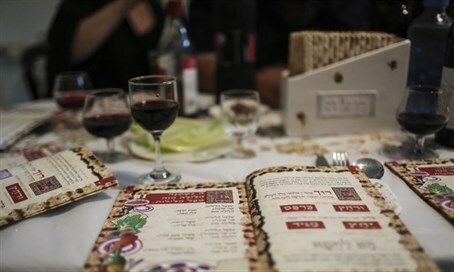 According to a Pew Research Center study released last month, 93% of Israeli Jews are likely to participate in a Seder this Friday evening, the first night of the Passover holiday. Passover remains one of the most widely observed Jewish traditions, with an overwhelming majority of even secular Jews participating in a Seder. According to the Pew study, 87% of secular Jews attended a Seder in 2015, compared to 97% of traditional Jews, 99% of religious Jews, and 100% of haredim. Passover Seder attendance is higher among secular Israeli Jews (87%) than American Jews as a whole (70%). Among secular Jews, only 47% said they attended a Seder, according to a 2014 Pew study. An in depth look at this year's Pew survey reveals that non-observance of Passover was highest among recent Russian immigrants (many of whom are not, however, halakhically Jewish). Among those living in households where the primary language is Russian, only 70% attended a Seder in 2015. By contrast, among those living in Hebrew-speaking homes, 95% participated in a Seder. Despite the enduring popularity of the Passover Seder, more than a quarter of Israelis opted for “non-traditional” Seders last year. While 67% of Israelis attended a traditional Seder, 26% participated in an “alternative” Seder. Nearly all haredi, religious, and traditional Jews attended traditional Seders, compared to only 41% of secular Jews. Some 46% of secular Jews said they had participated in a "non-traditional" Seder.